When James Smith was released on parole in 2007, the Department of Corrections gave him $200 and pointed him out the door—he had no support, nowhere to go, nothing but the clothes on his back. It had been years since he had been on the outside. In a matter of months, Smith was asking his parole officer whether he could be sent back to prison rather than finish parole. Without a job, life outside of the California Rehabilitation Center, a medium security facility in southern California a few miles west of Riverside where he spent close to five years on an assault charge, proved to be difficult—too uncertain. Parolees are required to stay in the county of legal residence at the time the crime was committed, so most of Smith’s two years on parole were spent in Escondido, California, a town at the northern tip of San Diego County. A month after his release, he got a job working day-to-day with Labor Ready, a temporary labor service that provides workers for industries such as construction and warehousing. During Smith’s time there he did whatever work he was assigned, and struggled to make ends meet at $7.50 an hour. Smith who has since moved back to Oakland, is one of more than 8,000 formerly incarcerated individuals living in the city, and experts have found that many report difficulty finding work, job training opportunities, or housing once they are released. “It’s like if you commit a crime, you’re never worth anything again,” said Smith. In cities like Oakland, getting a job is already hard for thousands who are seeking work. As of August 2010, the unemployment rate was 17.4 percent, up from 7.5 percent at that time in 2007. 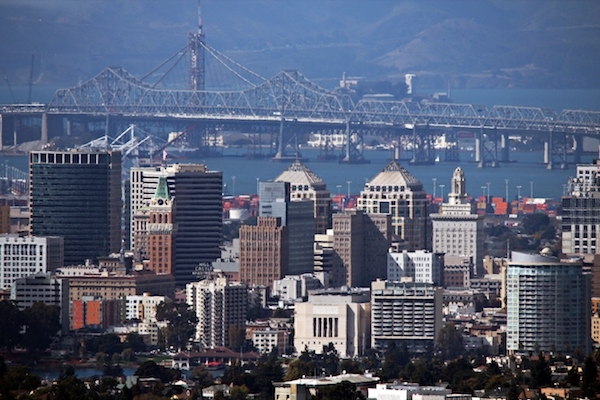 An analysis of new 2009 census data by the East Bay Alliance for a Sustainable Economy (EBASE), an economic advocacy group, found that the poverty and unemployment rates were disproportionately high in Oakland compared to the combined average unemployment rate for Alameda and Contra Costa counties, which is 11.5 percent. The EBASE report found that even people who were employed throughout the recession struggled financially. 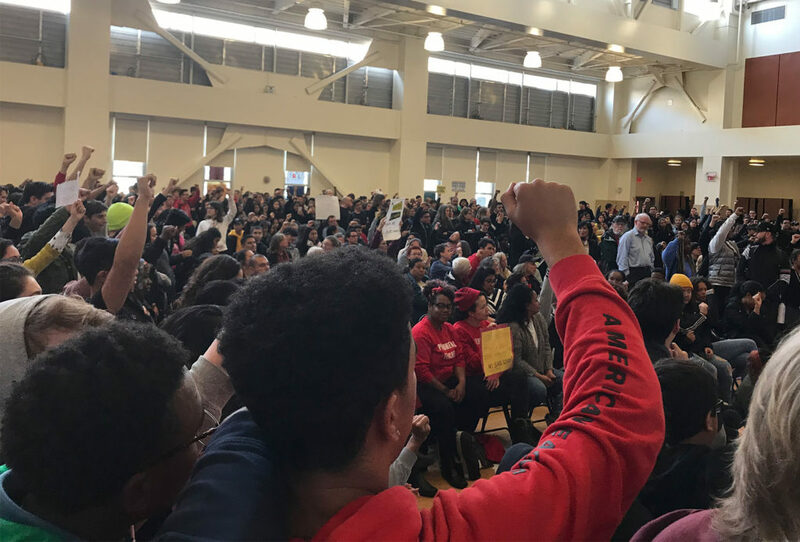 According to the report released in September, two in five East Bay residents considered poor are actually working full or part time, many of them low-wage workers earning roughly half of what the report considers a livable wage. The report considers a family of four making an income of less than $44,000, or an individual making less than $22,000 a year, to be facing economic hardship. Using this rubric, 39 percent of Oakland’s 372,000 residents are living in economic hardship, compared to an average of 25 percent throughout the East Bay. According to federal guidelines, being poor means making less than $11,000 a year for a single person living alone—for a family of four, it’s about $22,000. According to the study, Oakland residents who kept working through the recession did it for fewer hours each week. At the same time, median household earnings for the region declined by more than $2,000 over the two years of the recession. Instructors Greg Brooks (left) and Pat Howard (center) talk to students of The Alameda Transportation and Logistic Academic Support initiative or ATLAS, an Oakland-based professional development program. For Smith and the rest Oakland’s formerly incarcerated population, the outlook is even bleaker. According to the California Research Bureau, parolees face a high unemployment rate—80 percent. One in 10 parolees becomes homeless immediately upon parole, and between 60 and 90 percent lack practical skills such as the ability to control their anger, balance a checkbook, or find a job. Half are also illiterate, according to the agency’s 2003 report, the latest year for which these statistics are available. Like many of the people detailed in the most recent EBASE study, Smith was able to find work, but not enough to keep him above the federal poverty line. He was in out of work—and until recently—unemployed for a while. After being released from prison in February, 2007, he shared a windowless 12-by-12 foot room for $500 a month at a clean and sober house in Vista, California, but left after he accidentally kicked a used syringe while walking down the hallway in his socks. He worried about being in an environment where other people were using drugs. “It didn’t stick me, but I have used drugs before, and in the throes of despair it’s not hard to start again. I had to go.” Smith said. He would later move into the New Resolve Residential Program, a transitional home for veterans in Escondido. Smith filled out application after application. He never omitted the part about his criminal history. “When they ask me about it, I would say that I’ve made a mistake and did my time,” he said. After leaving Labor Ready and moving to Escondido, he worked nights at Hunter Industries, an irrigation equipment manufacturer a town over. Eventually, Smith was laid off. “I was making barely enough to pay the rent on time, and maybe something to eat sometimes,” he said, referring to the two years after his release. His Social Security earnings report for 2007 showed he had made about $6,000. The following year he made about $12,000. James Smith is a certified forklift operator since graduating from ATLAS. Shortly after his parole ended, Smith moved back to Oakland, unemployed but now reunited with his wife of two years. He decided to enroll in an 11-week vocational training program called the Alameda Transportation and Logistics Academic Support Initiative (ATLAS), a professional development program in logistics training—shipping, forklift operation, and warehouse management. The program also aids its participants with personal development, resume writing and job placement. ATLAS trains people of varied backgrounds from those without a high school diploma to those with a graduate degree, from housewives to former convicts. Smith was one of the few people out of more than 100 hundred applicants accepted into the program. “You need training programs to buttress a job creation effort if you want to be successful,” said Greg Brooks, a career advocate for ATLAS since February 2010. He worked closely with Smith during his time in the training course. The group, which is part of Oakland’s Workforce Collaborative, in partnership with the College of Alameda, is currently teaching its 10th group of trainees. The EBASE report points to programs like ATLAS as a model for preparing Oakland residents for jobs that can provide livable wages. Indeed, some experts believe that training programs like this one help prevent recidivism and reduce unemployment among former inmates. Studies by Stanford University’s Criminal Justice Center and the Urban Institute conducted last year found that remedial education programs, when paired with vocational job training, led to higher rates of employment after release, and a 20 percent reduction of recidivism rates compared to those who received no assistance. For Smith, the program worked. After completing his ATLAS training in April, he was hired as a temporary employee working 20 hours a week at $12 an hour at St. Vincent de Paul’s East Oakland facility. He would work there for four months before being reassigned another temporary job—this time, 30 hours a week—at the non-profit organization’s Livermore location. These jobs still didn’t pay enough to pull him out the range that EBASE considers economic hardship—a threshold of about $1,800 a month. Oakland resident James Smith was in and out of work for years after being released from prison in Southern California.